I long for the day when Malcolm Turnbull decides to stop talking nonsense about climate and abandons his hopeless quest to get his old job back. Let me make this clear: you will NEVER, EVER be leader of the Liberals again. Leader of Labor, very possibly, but not the Liberals. He also rejected the view Australia should wait for China and India to act, saying Australia’s emissions were much higher per capita. Mr Abbott said this week that Australia’s emissions reduction target, backed by both sides of politics, was “crazy” because it would be overwhelmed by pollution increases in China. The reason our emissions per capita are so high, Malc old mate, is because we have a thriving, highly productive, emissions-intensive economy with a tiny (approx 20 million), relatively wealthy population. China and India on the other hand have massive populations (both over 1 billion, and each more than 50 times greater than Australia’s) still barely able to crawl out of poverty. Divide a small number by a very small number you get a big number. Divide a big number by an even bigger number, you get a smaller number. It’s junior school maths. 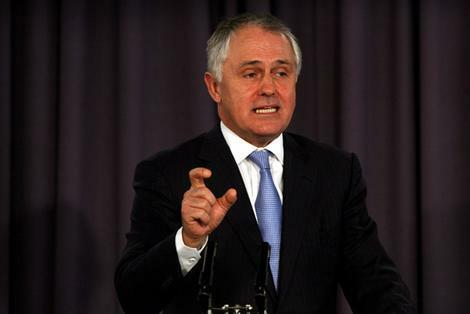 An insult to our intelligence, Malcolm. Go away. P.S. And while we are about it, when you urge us all to respect “the science” does that include “the science” published by Richard Lindzen, Roy Spencer, Bob Carter etc etc, or only “the science” which fits with your alarmist agenda? « Sea level rises "decelerating"
Sorry Mal, but while so called ‘scientists’ run around in white coats wringing their collective hands and call carbon dioxide – carbon pollution – they’ll never earn my respect. Carbon pollution is a political name for carbon dioxide and has no more to do with science than Jedi mind tricks! Climate change is actually irrelevant in the current carbon tax debate, as the proposed 5% OZ reduction will make a 0.07% reduction to global emission, thus having no affect on the climate. Even if the whole world followed the proposed Gillard reduction it would still leave 95% of global emissions! Yes we can reduce emissions, but not by a stealth wealth move, as is proposed, or a carbon trading scheme that the wealthy Malcolm Turnbull is salivating over! Sorry Julia, but just like you or I, Mr Turnbull is allowed to draw his own scientific conclusion, but as I said before your approach makes no difference to climate! Turnbull’s getting desperate to keep the scam alive. Perhaps he had wind of yet another kick to the nethers of the great global swindle. What’s to become of our $599 million, then? Or will Brown’s mob stump up with even more to pick up the slack? Over the next years the comparative per capita CO2 usage will change quite a bit. I think we should use per capita as a metric and try to close that relative gap. The best way for all concerned is to help India and China to increase their per capita CO2 usage. Plantlife will LUV it. !! He also implies that skeptical scientists like the ones you mentioned have all the credibility of a random from the pub and that all skeptics are conspiracy theorists. The man is entirely ignorant on the subject he holds so dear. There is no doubt that in 1988 Maggie was the first world leader to voice alarm over Global Warming and gave generous funding to the UK Met Office. However what is never quoted is that in 2003 she recanted. In her final book, Statecraft, she devoted 10 pages in the last chapter to Global Warming. She voiced precisely the fundamental doubts about the warming scare that have since become familiar to us. Pouring scorn on the “doomsters”, she questioned the main scientific assumptions used to drive the scare, from the conviction that the chief force shaping world climate is CO2, rather than natural factors such as solar activity, to exaggerated claims about rising sea levels. She mocked Al Gore and the futility of “costly and economically damaging” schemes to reduce CO2 emissions. She cited the 2.5C rise in temperatures during the Medieval Warm Period as having had almost entirely beneficial effects. She pointed out that the dangers of a world getting colder are far worse than those of a CO2-enriched world growing warmer. She recognised how distortions of the science had been used to mask an anti-capitalist, Left-wing political agenda which posed a serious threat to the progress and prosperity of mankind. In other words, long before it became fashionable, Lady Thatcher was converted to the view of those who, on both scientific and political grounds, are profoundly sceptical of the climate change ideology. Indeed she could claim to be the first Global Warming Sceptic. Of course Turnbull never mentions this. Excellent observation and summary, Chris. Thanks. YES thanks for putting up that information. I had heard The iron lady had chanced her stance, but of course you never hear the AGW admitting it. Over $400million of the Fast Start Financing Fund is already allocated to climate change mitigation in Asia and SE Asia. It’s the UN’s Green Climate Fund that Minister Combet signed at COP16 Cancun that is the worry. It represents 10% of any of carbon tax or ETS revenue once it is ratified at COP17 Durban S.Africa this coming December. Lady Thatcher was also a scientist, as she had a Batchelor of Science, Chemistry, specialising in Xray crystallography. She worked as a research chemist before involvement in politics. She was eminently qualified to make judgement on the value of CO2, and like a lot of scientists made an incorrect judgement early in the saga. Malcolm Quisling is delusional. Margaret Thatcher never “believed” in global warming. “And the Conservative Party wanted a large UK nuclear power industry for another reason. That industry’s large nuclear processing facilities were required for the UK’s nuclear weapons programme and the opposition Labour Party was then opposing the Conservative Party’s plans to upgrade the UK’s nuclear deterrent with Trident missiles and submarines. The problem with Julia is that she never learned the whole story about King Knut. The shrewd Danish king of England didn’t really think that rulers could command the seas to recede. He was trying to show his idiotic ministers that he was not all powerful. Knut knew very well that a carbon tithe would not make one bit of difference to the forces of nature. The warmists should listen well. There is nothing we do, or can do to change the force of nature, especially the power of our sun. Malcolm Turnbull was only stating Liberal Party Policy. See here for Greg Hunt’s statement called ‘Cutting Carbon – A Third Way: Reducing Emissions Without A Big New Electricity Tax’. http://www.liberal.org.au/Latest-News/Blog/2010/09/27/Cutting-Carbon–A-Third-Way.aspx. The Liberals have the same target as Labor – to reduce emissions by 5%; they only differ in how to do it. It will still involve using our taxes to pay for the reduction. So who do we vote for in 2013 – a party levying a Big New Tax or a party using our general taxes (which would otherwise be used to pay for Medicare, defence, etc)? Both are trying to achieve the same outcome, which is reduce carbon dioxide emissions by 5%. Neither Liberal nor Labor Maude – you vote for the Climate Skeptics Party & leave it to them as to whom they choose to credit their preferences! Even if he managed to emulate that one time Democrat Cheryl, or that tonsorially compromised and eventually outed faithless, morally bankrupt and once so uber-Green rock’n’roller, (or Winston, or Benedict either), he’d still be miles behind Oz’s finest rat: Billy Hughes. Just for the record, over the course of his 51-year federal parliamentary career, Billie changed parties five times: and he was expelled from three of ’em and he managed to represent four different electorates in two states.